The Post Graduate Programme in Management (PGP) of the Indian School of Business (ISB) has jumped four places to be ranked among the top 25 in the Financial Times Global MBA Rankings 2019 at 24th position. Ranked 28th last year, ISB's foray as the only Indian B-school in the top 25 of the FT Global MBA Rankings 2019 came on the back of a 187 per cent increase in salary of its alumni. ISB's alumni salary increase is the third highest globally behind China's Fudan University School of Management's 195 per cent, and Shanghai Jiao Tong University, Antai's 193 per cent, respectively. The ranking calculates average alumnus USD salary three years after graduation in terms of purchasing power parity (PPP) equivalent with adjustment for variations between sectors. The FT Global MBA Rankings ranks 100 top global one-year and two-year postgraduate programmes for candidates with prior work experience. 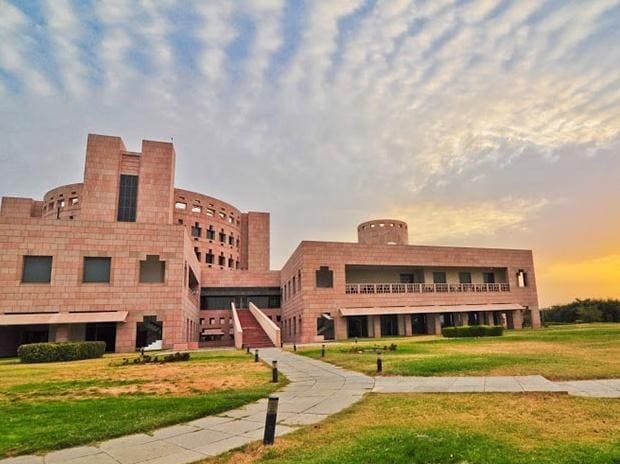 Unlike ISB, the Indian Institutes of Management (IIMs) who offer one-year programmes for executives with prior work experience are qualified in the FT Global MBA Rankings. 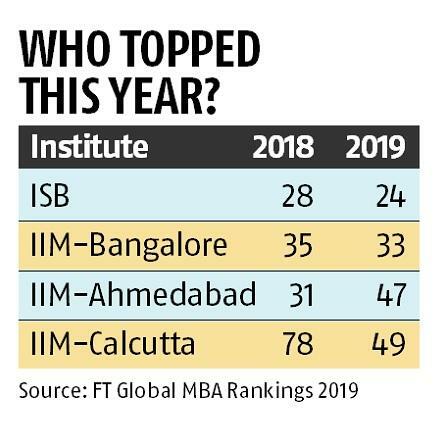 Among these, following ISB is IIM Bangalore's one-year executive postgraduate programme (EPGP) which rose two places to be ranked at 33rd position, up from 35th last year. IIM Ahmedabad's PGPX, however, fell from last year's 31st position to 47th position this year. However, it was IIM Calcutta's PGPEX which saw the highest rise in its rankings of 29 places to be ranked at 49th position in the FT Global MBA Rankings 2019, up from 78th position last year. According to ISB Dean Rajendra Srivastava, efforts such as ensuring admission of quality and diverse students and faculty, along with high research impact have led to the Indian B-school stand out in the global arena. Citing the University of Texas at Dallas (UTD) Top 100 B-school Research Rankings 2015-18, Srivastava said that ISB was ranked 26th worldwide in terms of per-capita productivity of its faculty in research publications in leading global journals. "ISB was established with a vision to be a globally top-ranked, research-driven, management institution. After 12 years of the School’s consistent top performance in the FT Global MBA Rankings 2019 we can be proud of our global positioning as an institute of eminence from India. It is very heartening to see three other prominent business schools from India feature in the Top 100. This goes a long way in helping strengthen the Study in India initiative and help promote India as a destination for high-quality management education," said Srivastava. Apart from ranking high in terms of the number of students who are placed within three months of graduation, ISB has made steady progress across other key parameters like weighted salary, the percentage of aims achieved, career services success, value for money, and alumni recommendation.